* Since some people are not reviewing my README file before installing the addon, I'll make this clear upfront. Do not install any test files from the embedded rar archives unless you are planning on making your own hacks. Those 2 files make messages scroll down your screen every time you move the mouse over a sink. They are only for testing hacks that you make yourself. 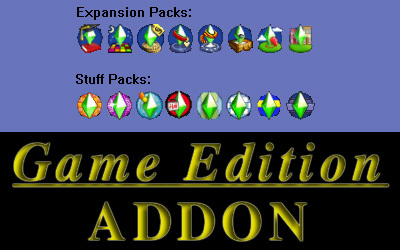 This is simply a tool that allows all of my hacks to be backward compatible with all or most editions of The Sims 2, from the original base game of 2004, up through the latest Expansion Packs: such as FreeTime / Apartment Life / Mansion & Garden Stuff. It adds global BHAV routines that permit any hack from any author to check which EPs/SPs are installed upon the player's computer. Any functions that already come with the game are either broken or sorely lacking in functionality. So I coded my own routines to do the job properly! This addon is the end result of my desire for 100% accuracy in determining which game engines are installed with the minimum amount of CPU processing power spent executing the checks, all accessible globally from any hack. That is the main reason for this addon. Plus, the global routine "Expansion Pack - EP(param) Installed?" that comes with University and higher is not a proper solution to this issue because it does not take into account the base game, returning false positives for many EP checks. In addition, it crashes when checking for "Apartment Life" on older EPs. * Check out the readme.txt file for more information.